In the many years I’ve been with the College, I’ve been accustomed to seeing uniformed officers on campus. From attending the many police recruit academy graduations over the years, it is certainly a point of pride for our organization as I see the difference we are making by preparing new officers to protect and safeguard our homes, families, and communities. 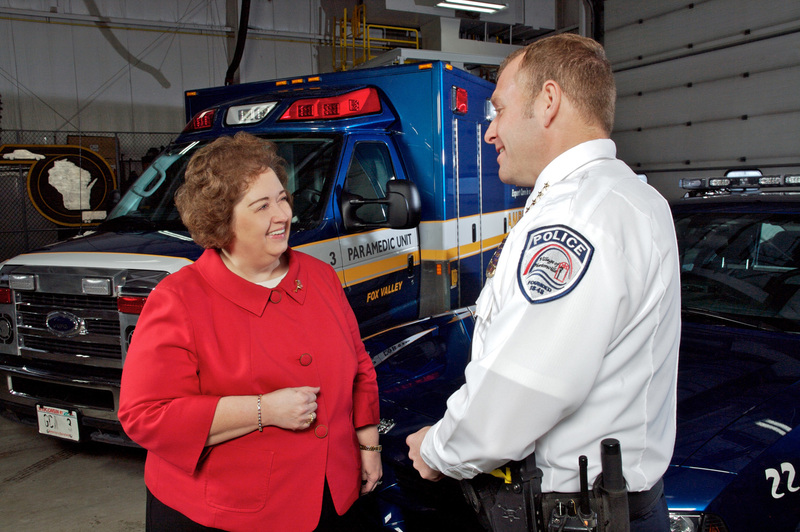 Dr. Susan May converses with Hortonville Police Chief Mike Sullivan, an FVTC alumnus and ongoing trainee of the college’s public safety offerings. In the next few days, our College will welcome law enforcement professionals from not only the region, but from all across the country, to participate in one of our national conferences on Responding to Missing and Unidentified Persons…right here in Appleton. I can’t even imagine the anguish that is felt when a loved one is missing. I do know, however, that immediate response by well-trained professionals makes a difference. During this conference, participants will learn critical response measures they would need to take should this kind of event occur in their community and they will come to understand these incidents, first-hand, from parents of children who have gone missing. You may not realize the extent to which the College works with employers (both private and public) to provide ongoing training for working professionals. Last year alone, more than 20,000 employees received training from FVTC through their employers. We also offer many national conferences and seminars that bring out-of-state visitors to our campus and our community. Many of these participants are firefighters, police officers, and emergency medical technicans that keep communities safe. Many crimes today are no longer local or even state events…particularly crimes such as child abductions. These quickly require coordination and communication across jurisdictions, across state lines, and sometimes internationally. Having a well-coordinated system of criminal justice is critical to positive outcomes in cases such as these. This week’s conference causes me to reflect on our upcoming capital referendum to support our facilities expansion. One of the projects in this referendum is the Public Safety Training Center, an inter-disciplinary, tactical training facility for public safety personnel and the communities they serve. This means one location will be able to support realistic, hands-on training for fire, police, forensics, emergency rescue, wildland fire, and related services. Police and fire chiefs from throughout Wisconsin gathered at FVTC recently for a Risk Management and Management Issues seminar. This facility will not only serve students enrolled in our wide range of public safety programs, but it will also serve the public safety professionals working in these fields from all across the region who require ongoing training and experiences that provide realistic situations and opportunities for joint training exercises. When our local participants are joined by professionals from other corners of the state or out-of-state, it only adds to the richness of the training experience for everyone. And visiting participants contribute to the local economy when they stay in our hotels, eat at restaurants, and shop in the community. We had an independent study conducted to quantify the economic impact of the proposed Public Safety Training Center and the results are very impressive. While the various tactical training elements of this facility such as the burn tower, trench rescue system, and indoor/outdoor firing ranges involve an investment of almost $35 million, the results of the study conducted by NorthStar Economics, Inc. indicate that this facility will generate over $100 million in economic impact for this region in the first five years alone (in the form of dollars into the economy, related jobs in the private sector, and tax revenue generation). This particular project is about ensuring that our public safety personnel are not just adequately trained and prepared, but are given the opportunity for on-going skill development that will ensure the safety and well-being of our communities. 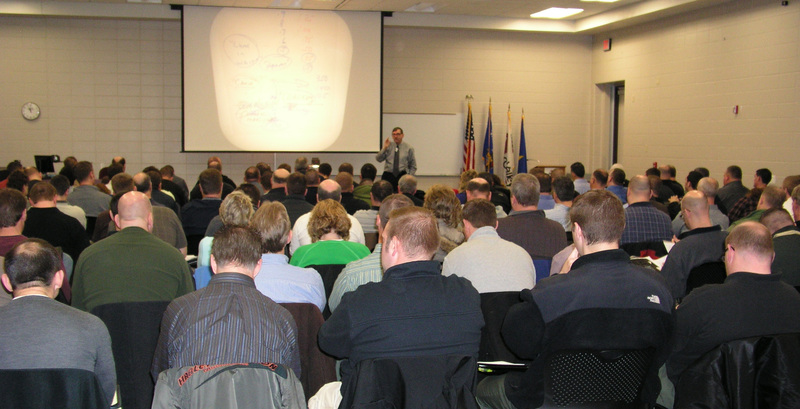 Meeting this objective requires a comprehensive tactical training facility and top-notch professionals sharing their expertise and designing scenarios that allow for practice…before the actual event–the child abduction, the illegal drug operation, the multi-unit apartment fire, or the ice rescue on Lake Winnebago–occurs. I would urge you to learn more about the needs of this region’s public safety sector and the on-going practical training that public safety personnel need as our world continues to become more and more complex. Find more information on our website: www.fvtc.edu/referendum and consider how important this is to maintaining safe, healthy, and low-crime communities. We tend to take these services for granted until the day comes where we are face-to-face with an emergency of some kind. Help us continue to prepare the very best in this business!